There's yet another digital assistant for hire. 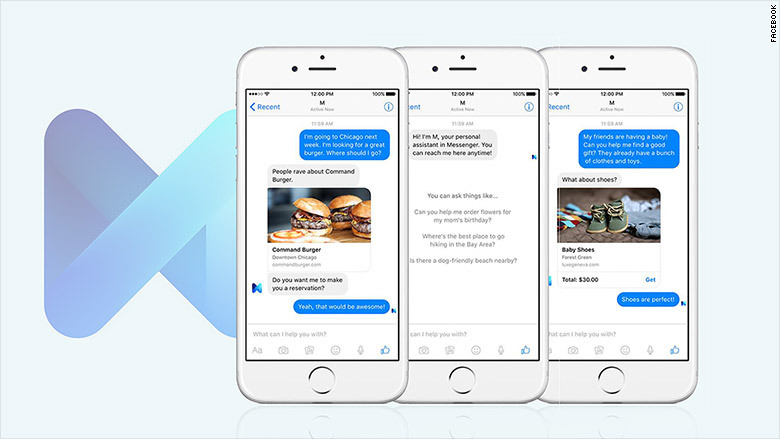 On Wednesday, Facebook announced M, an artificial-intelligence powered assistant programmed to do your bidding. The feature is tucked into Facebook's stand-alone Messenger app and is only available to a few hundred test users in the Bay Area to start. M is entering a crowded field that includes Apple's (AAPL) Siri, Microsoft's (MSFT) Cortana, Google (GOOG) Now and Amazon's (AMZN) Alexa. Like most of those assistants, M answers the regular questions about things like restaurant recommendations, trivia and weather. But M is a little different. First, it doesn't have a voice. You communicate with it using text, just as you would any other private Messenger conversation. Related: Which is the best digital assistant? It does many of the things that other assistants cannot. Like Amazon's Echo speakers, M wants to help you spend your money. It can place online orders for things like flowers and book hotels. It communicates more with the outside world, booking appointments or getting through customer service hotlines. Startups Magic and Operator have launched similar tools. You text requests to order food, deliver flowers or find a product, and a live operator will make it so. "This is early in the journey to build M into an at-scale service. But it's an exciting step toward enabling people on Messenger to get things done across a variety of things," said David Marcus, Facebook's VP of Messenger products, in a post announcing the tool. And then there are the things M can't do. M doesn't really know you, at least not yet. It's more of a runner than a personal assistant. M is not as involved in your day-to-day life as OS-based assistants like Siri, Cortana and Google Now. Those tools have access to powerful amounts of personal information, like your calendar and commutes, search history, likes and dislikes. M isn't pulling any information from your Facebook account -- all it's using is what's in the conversation thread. And at least until it gets a voice, M is refreshingly gender neutral. Early rumors about the assistant said it was called "Moneypenny" internally, but Facebook says it just stands for Messenger. The single letter actually calls to mind another, more powerful Bond character: the head of Britain's Secret Intelligence Service. It's unlikely that M would ever run out and buy your significant other an anniversary gift. M will start rolling out slowly to other iOS and Android Messenger users in the next few months.